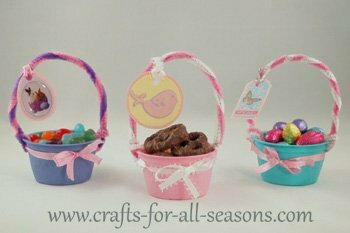 These mini easter baskets are sure to please! They look cute filled with jelly beans and small suprises. This is a craft using recycled plastic applesauce or fruit cups. My daughters eat a bunch of these so I wanted to put these cups to good use. 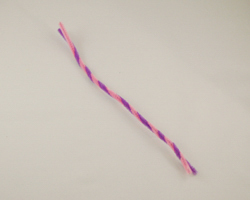 The cups create the basket, and pipe cleaners are used to make the handle. 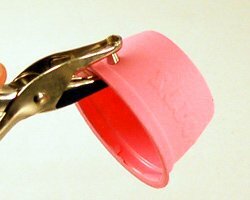 A cupcake liner fits neatly inside the cup. These would make cute wedding favors or shower favors for a Spring event. 1. 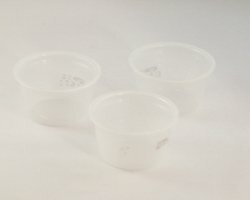 Begin by cleaning out the plastic fruit cups well, and allow them to dry completely. 2. Punch a hole on each side of the fruit cup with a hole punch. You will need some strength here, squeeze hard! Alternatively you could also use a drill (much easier) or a dremel tool with a drill bit. This may be a better option if you are making a lot of these. 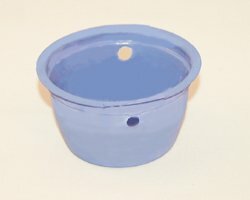 In the photo below, you can see I painted the cups first, however I learned it would be much neater if you paint the cups AFTER you punch the holes so you don't have to worry about ruining the paint. 3. 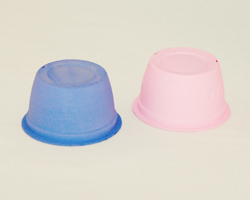 Give the cups one or two coats of spray paint to cover them completely. Make sure your spray paint is compatible with plastic surfaces. Allow them to dry. 4. 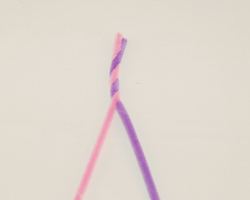 Using two different shades of pipe cleaners, gently twist them together as shown. 5. 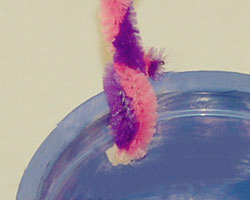 Thread the end of the twisted pipe cleaner through the hole in the basket, beginning on the outside and threading the end to the inside of the cup. Then twist the inside short ends up and around the handle to secure, as shown. 6. Tie a ribbon around the Easter basket craft. Add a cupcake liner for the goodies. 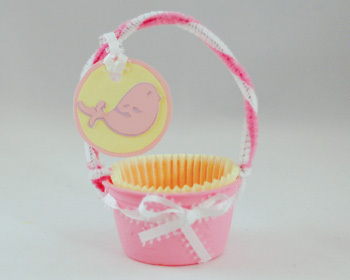 You can also add a cute tag if you like, using die-cuts, stickers, or stamps. I hope you had fun making this Easter craft!